A real “one man show” which lasts between 60-90 minutes depending on the age of the kids (from 3 to 103….!) Doves, rabbits, even a racoon with a difference, accompany Croky for a hilariously funny show (no live animals). Unforgettable! Any adults watching are guaranteed not to be able to keep a straight face…. 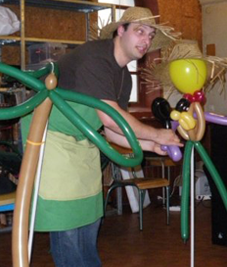 Balloon modelling – one for every child for small groups (10-20), and a great demonstration for larger groups.